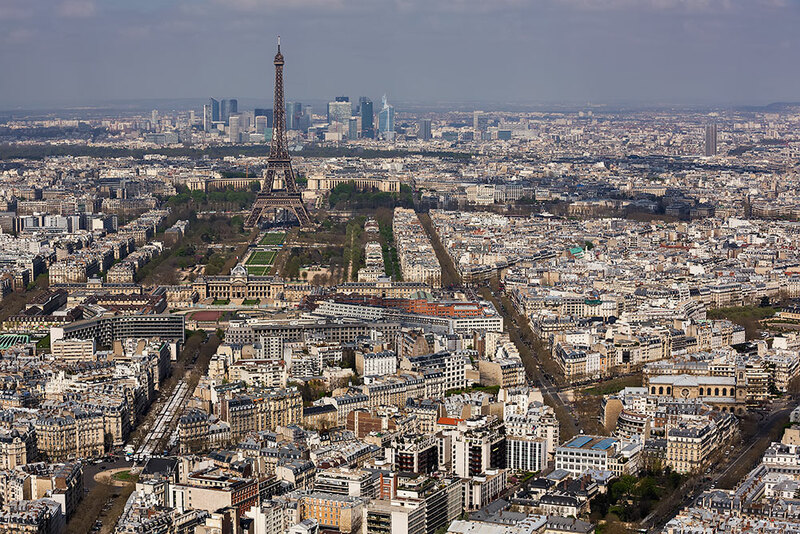 The 7 Best Spots To View Paris From Above. 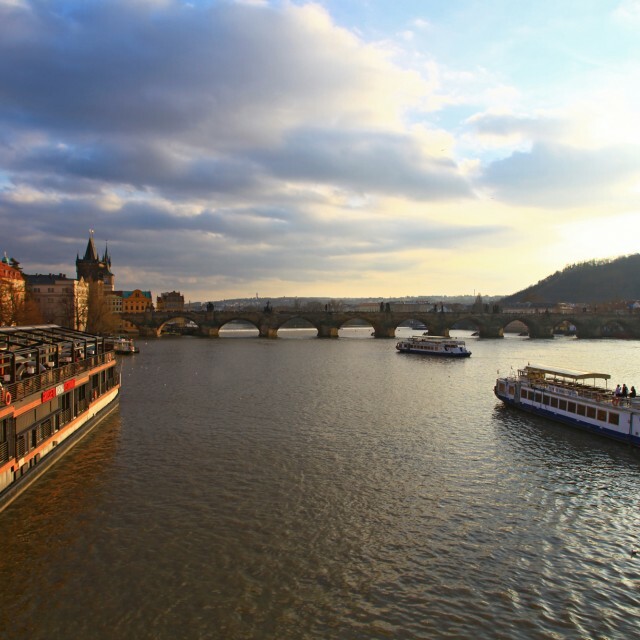 | Travel Photography Blog by Nisa Maier and Ulli Maier. 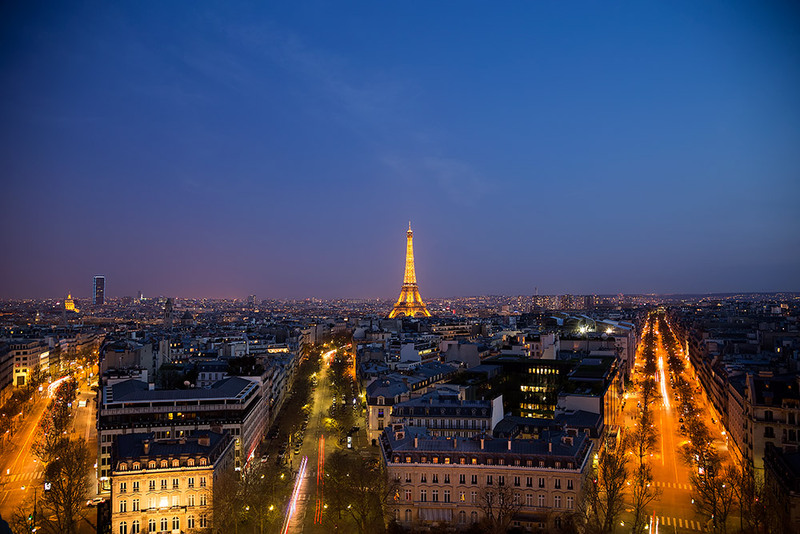 The 7 Best Spots To View Paris From Above. One of the best ways to get an overview of a city is to simply set the bar a little bit higher. 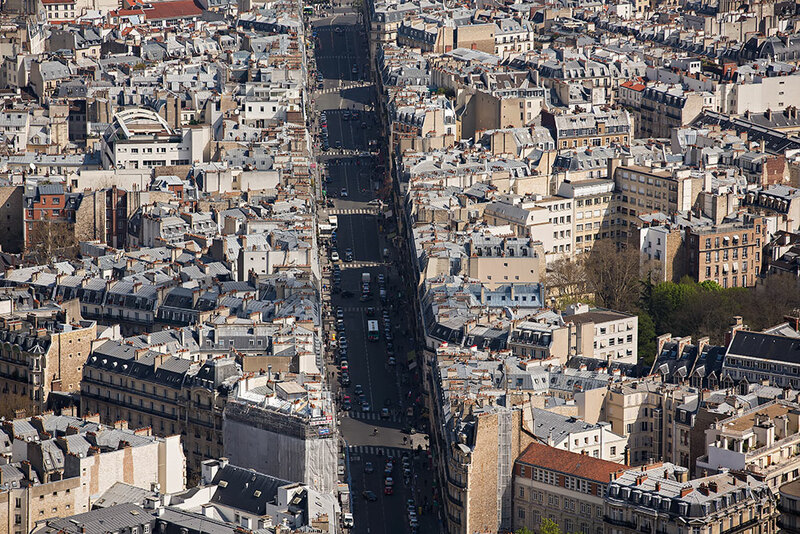 In Paris, there are lots of opportunities to see a whole new aspect of the city … for example through the bird’s eye perspective. This way, you’ll not only get to see all sights at once, but also get an impression on the size of this mega-city. 1. View Paris From The Eiffel Tower. The famous Eiffel Tower in Paris is one of the most frequented spot to view the city from above. 2. View Paris From The Basilica of Sacré-Cœur. 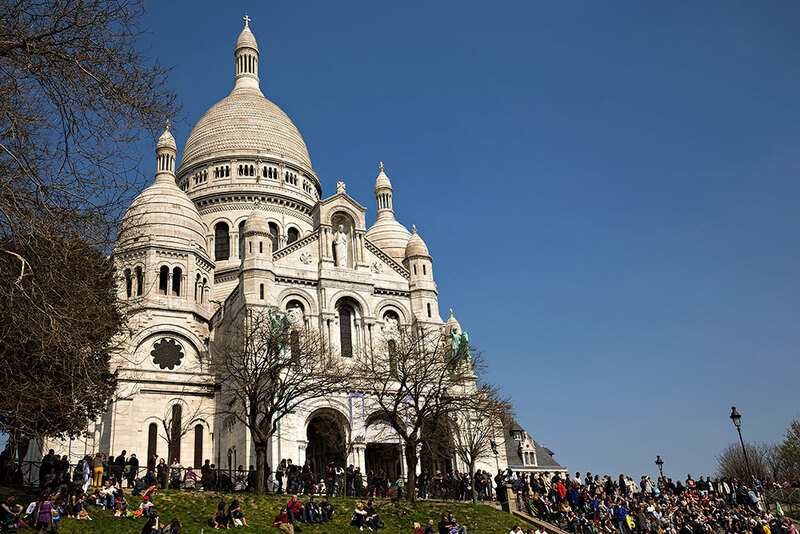 The Basilica of Sacré-Cœur is a must-see destination for ever tourist who visits Paris. 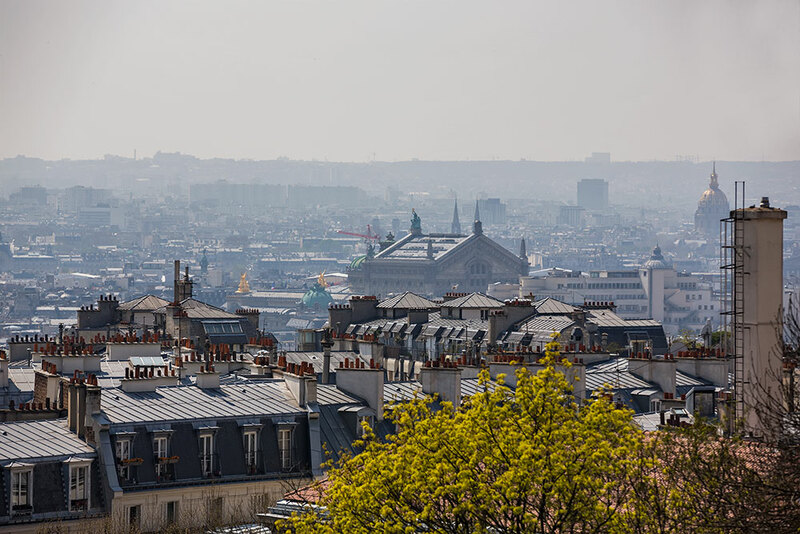 It’s just slightly over 80 meters high, which normally doesn’t make the best viewing spot, but because it’s located at the top of Montmartre hill, it’s actually Paris’ second highest point (approx. 210 metres). On a clear day, you’ll have an amazing 360° view over the entire city. The way up to the top is pretty tight, so if you’re claustrophobic, better stay on the ground – from there you’ll still have a wonderful view (which you’ll share with what felt like a million other people though). The Basilica of Sacré-Cœur in Paris is a highlight for every visitor. The view of Paris from the Basilica of Sacré-Cœur is really amazing. 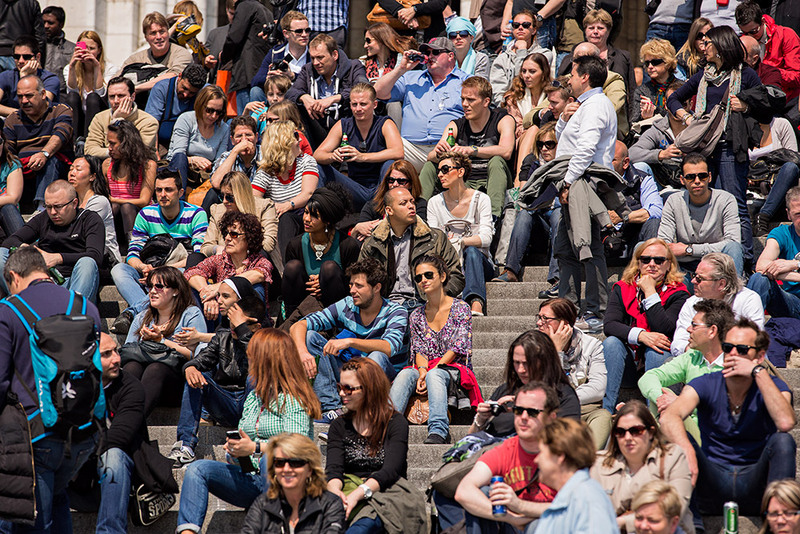 Crowds of people at the Basilica of Sacré-Cœur in Paris sit on its staircase to enjoy the sun. 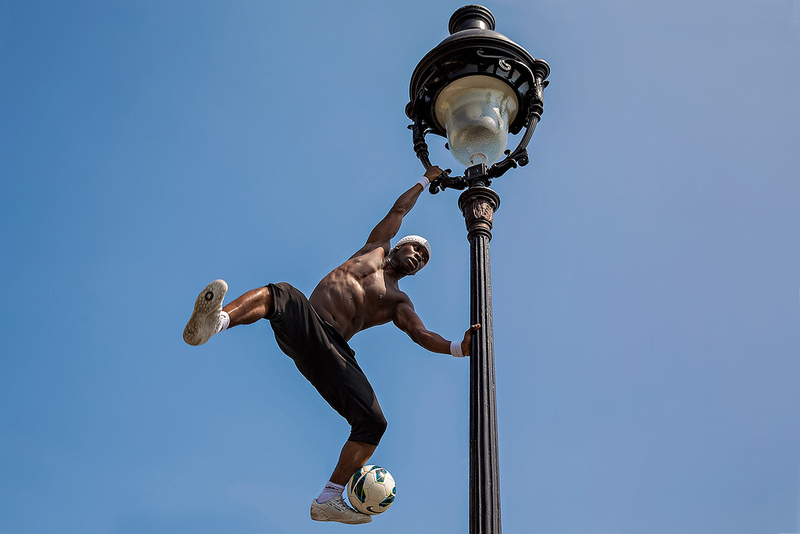 Freestyle footballer Iya Traoré at the Basilica of Sacré-Cœur in Paris. 3. View Paris From The Arc de Triomphe. The Arc de Triomphe is nowhere near the tallest building in Paris (it’s only about 50 metres high); it’s the location that makes it a favourite viewpoint. 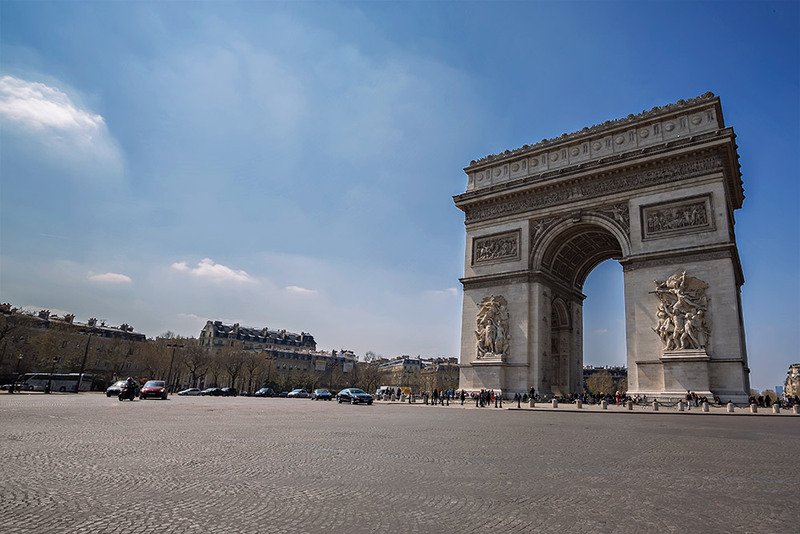 It’s located right at the end of the Champs-Élysées captivated by a gigantic roundabout, which forms part of an axis that leads from the Arc de Triomphe du Carrousel to la Grande Arche de la Défense. Until I found the tunnel opening at the near end of the Champs-Élysées, I always wondered how you can actually access it, because there’s no cross-walk and I’ve never seen any suicidal person running across is. But, luckily I found it :) In the tunnel-way you can buy the entrance ticket to go up the stairs. The view is amazing – especially at night – with the swarming traffic below that reaches the roundabout from all points of the compass. The famous Arc de Triomphe in Paris honours those who fought and died for France in the French Revolutionary and the Napoleonic Wars. The view of Paris with the Eiffel Tower in the centre. 4. View Paris From The Centre Pompidou. 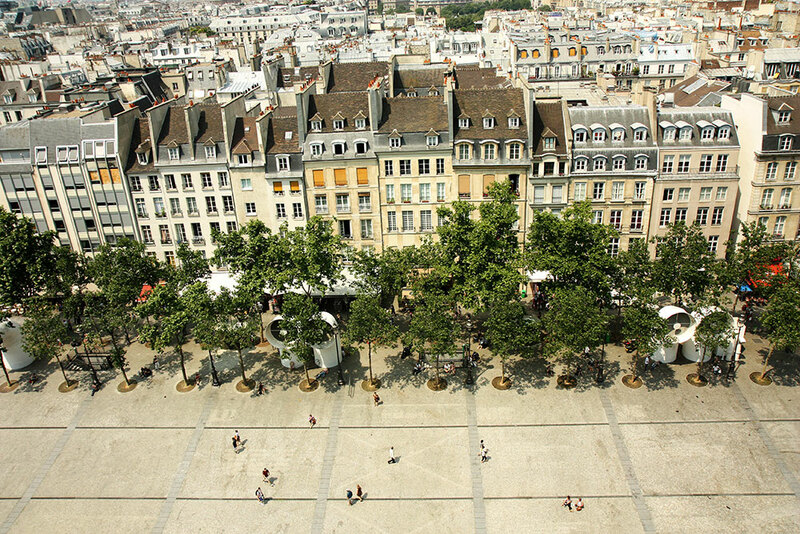 The Pompidou is the city’s leading modern art museum located in the 4th Arrondissement, Marais. It’s famous known for show-casing artists like Jackson Pollock or Andy Warhol, but it has another asset … the stunning view. Simply take the escalator to the fifth floor and start shooting, without having to save your place for hours in advance. The View from Centre Pompidou in Paris is one of those spots rather unknown since the museum is more well known for its art work..
5. View Paris From Galeries Lafayette. The world-famous Galeries Lafayette department store is well known among Parisians and visitors for the wide variety of products they offer, and for their glamorous window displays. However, fewer people know that there is a wonderful roof-top terraces, which accessible for the public – for free! 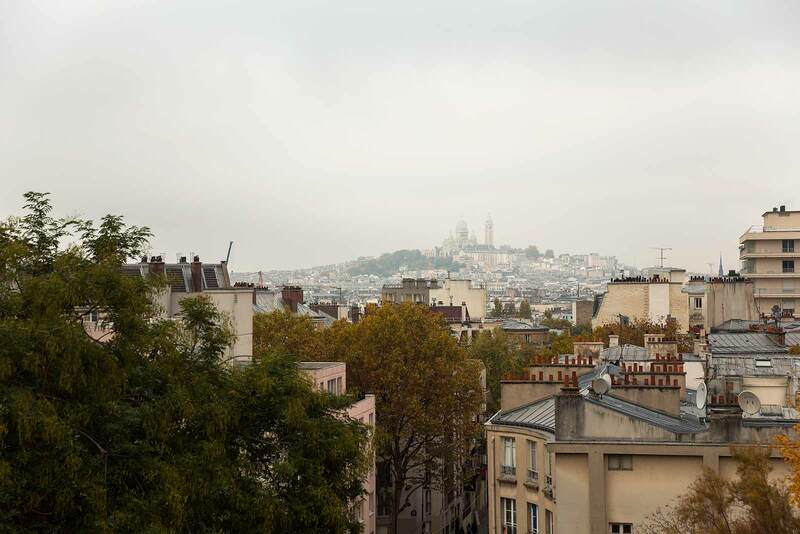 You get a wonderful 360 degree view over the surrounding Paris skyline. 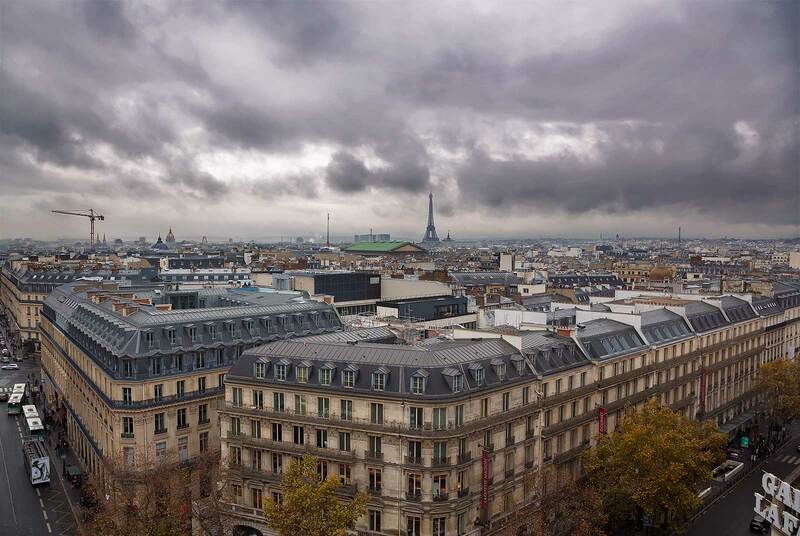 Galeries Lafayette offers a wonderful roof-top terraces for a brilliant view of Paris. 6. View Paris From Butte Bergeyre. There are many spectacular views in Paris that tourists have claimed. Most of them mentioned above. 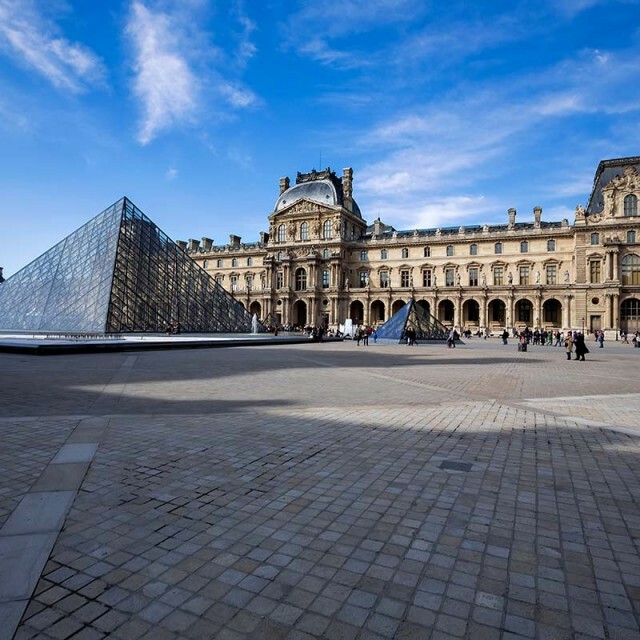 But there’s one spot that is actually still a hidden secret, even for Parisians. Butte Bergeyre, a quiet hilltop village hidden in the 19th arrondissement, is accessible only by three staircases or a single winding road. 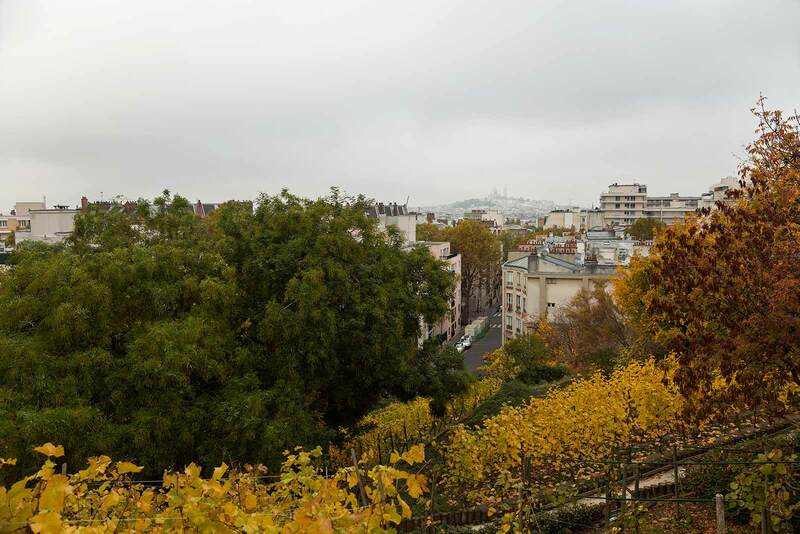 Once you reach the top of the stairs, a rewarding view awaits, including one of the few vineyards left in Paris. It’s not just Montmartre and Parc de Belleville that have the last remaining vineyards in Paris. At Butte Bergeyre you’ll not only come across a stunning view, but also a cute litte vineyard. At the top of Butte Bergeyre you have a stunning view of Sacré Coeur. 7. View Paris From Tour Montparnasse. I saved the best view for last. Tour Montparnasse definitely offers the most remarkable panoramic view of Paris (it covers a radius of 40 km). 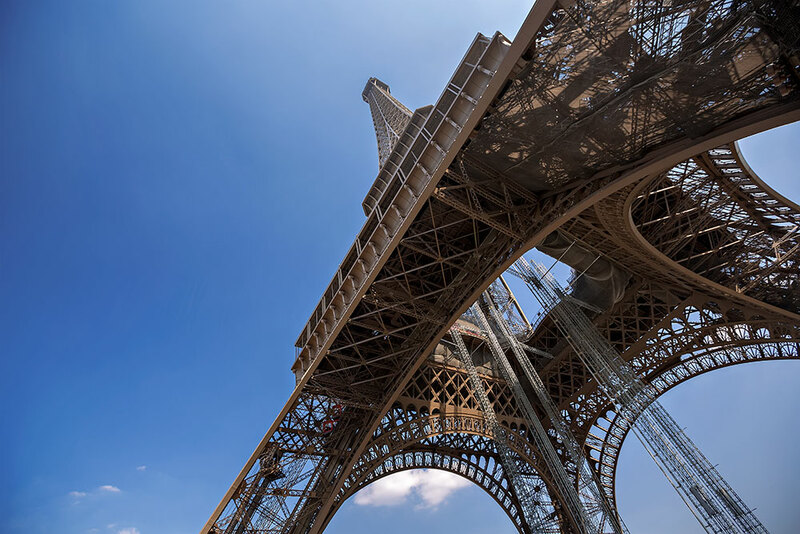 The Eiffel Tower might give you the same, yet the difference is that you won’t have to stand in line for hours, because many tourists don’t know that this rather ugly looking tower can actually be visited. Some people tend to say that the view from the top is the most beautiful in Paris, because it is the only place from which the tower itself cannot be seen… no further explanation needed, right? Tour Montparnasse is a 210 metre high structure which is located in an area, where most buildings don’t rise above 30 metres. Naturally you’ll think to yourself “Why by all means has this building been built right here?“. Well, you’re not the only one thinking that. The tower’s simple architecture and large proportions have often been criticised, because it simply looks out of place in Paris’s urban landscape. Only two years after its completion (1972), the construction of skyscrapers in the city centre was banned… Still, the tower deserves its place simply because of the stunning 360° view it provides. A super-fast lift will take you to the top in 38 seconds (the fastest elevator in Europe btw), where you’ll be able to shoot that one-million-dollar photo from the open air roof terrace. The view of the Eiffel Tower from Tour Montparnasse in Paris. 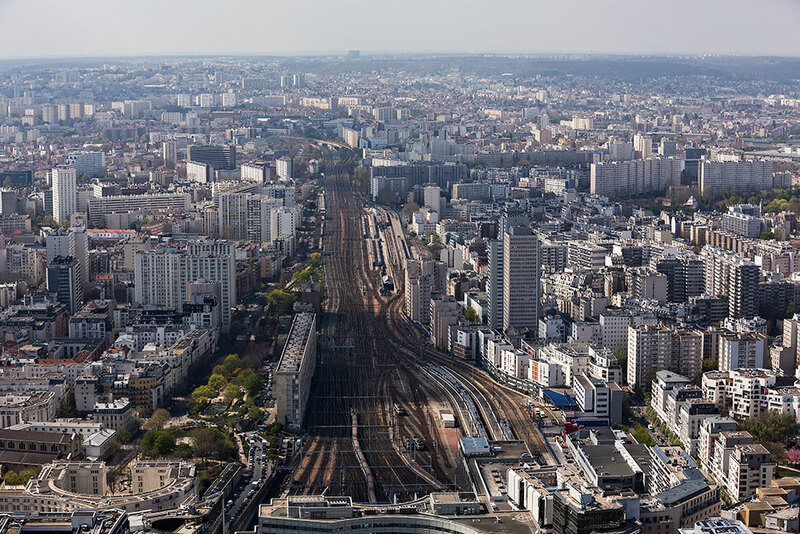 The view of Gare Montparnasse from Tour Montparnasse in Paris. 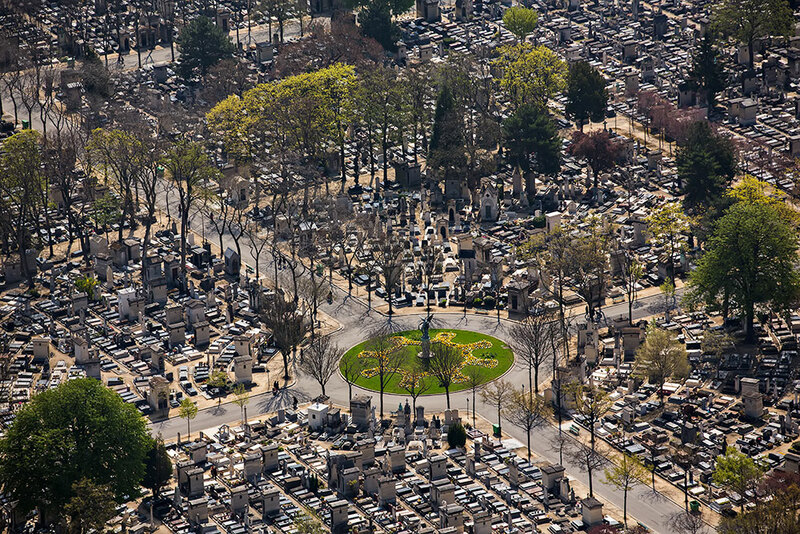 The view of Montparnasse Cemetery from Tour Montparnasse in Paris. The view from Tour Montparnasse in Paris. 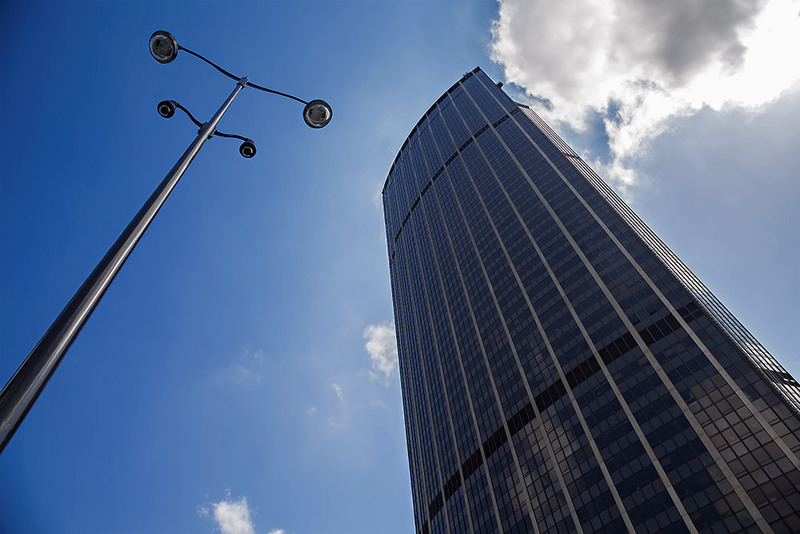 Drum-roll please … Tour Montparnasse in Paris is definitely not the nicest building.. Thanks heaps Helina! Glad you could find something of value for you :) Definitely check out one or the other spots if you want to see Paris from above. Have fun there! I love Paris and my favorite views usually come from a sidewalk cafe. Hard to beat all the sights, sounds and smells of Paris right at street level! No elevators or climbing stairs needed! After viewing your photos, my wife and I will be going to the Tour Montparnasse first thing to take a photo of the Eiffel Tower view. Your site was just what we needed to make our decisions on prioritizing our limited time in Paris. Thank you! 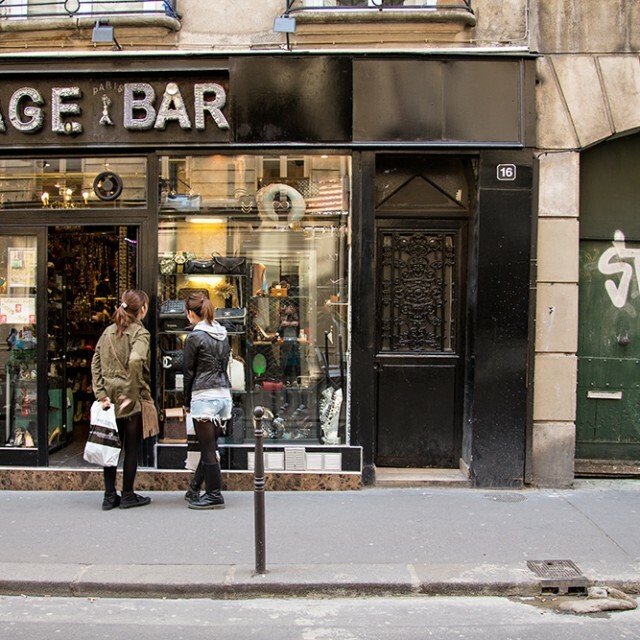 The 4th Arrondissement Of Paris: Le Marais. 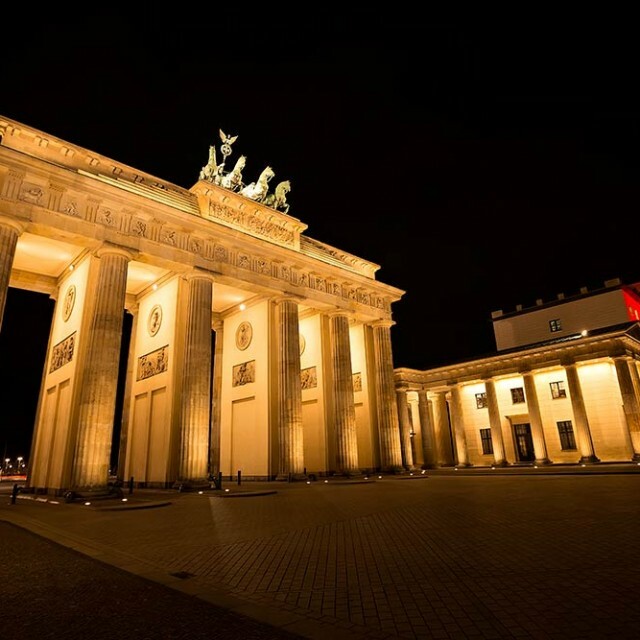 Top 5 Sights To Photograph In Berlin At Night.